So the day after Easter, I decided to make pasty for lunch. Everyone loves a good pasty. Its like a portable pie with comforting filling encased in a shortcrust pastry, ready to be eaten anytime, anywhere, hot or cold. 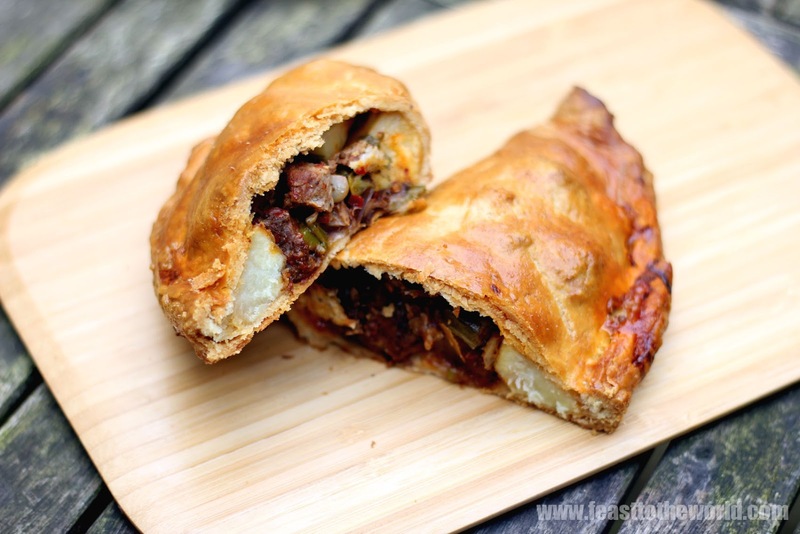 A traditional Cornish pasty contain beef, potatoes, swede and onion but I've decided to be frugal and make good use of my leftover lamb from my Easter Sunday roast instead. To give it just that little bit of oomph and bring the meat back to life, I have gone slightly non-traditional with the seasoning. I added some Harissa paste - a North African spice paste made using chillies and a variety of spices and herbs - which will add a wonderful spicy edge to the cooked meat and transform these baked parcels into something special. As you can see from the photo, I managed to do just that. 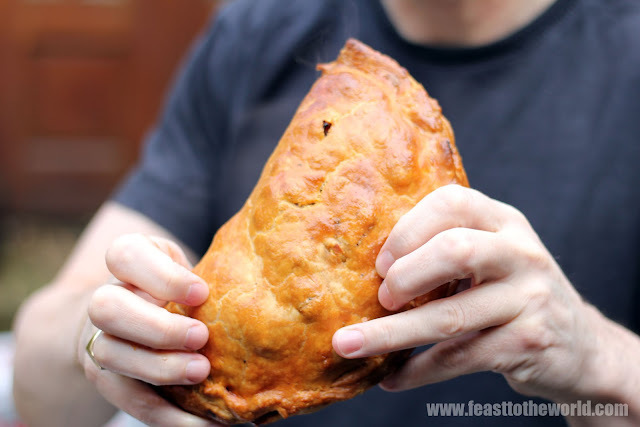 These special giant pasties will definitely stand head and shoulder above any bog standard pasty around, literally. Being the muddlehead that I am, I had unwittingly mistaken a 30 cm pan lid for 20 cm and used that as my cutting template instead. After folding and crimping the pasties, I then realised the ginormity of these pasties. So what was initially intended as a light lunch turned out to be a full blown meal in a crust. Not that I was complaining. I do love pasty after all. To make the Harissa paste, blitz all the ingredients in a food processor until you have a smooth paste. Season to taste and stored in an airtight container if not using immediately. They should keep for anything between 1-2 weeks in refrigerator. To make the pastry, sift the flour and salt into a large cold mixing bowl and rub in the cold butter cubes until you get a crumb-like texture. Add the egg and bring the mixture together into a dough, slowly adding a tablespoon of water at a time . You might not need all the water. Wrap with cling film and chill in the refrigerator for 1 hour. In a large bowl, mix the lamb, leek, onion, potatoes, swede and the Harissa. Season with salt and pepper. Roll out the pastry on a lightly floured surface to about 5mm thickness. For giant pasty, cut two 30cm circles or three 20cm for the regular ones. Divide the fillings between the pastry, leaving space around the edges. Brush the edges with the beaten egg and fold one end of the circle over to form a half moon shape. Press on the edges to seal and crimp as you would do with a cornish pasty. Brush the pasties with more beaten egg. Note: Alternatively, press along the edges of the pasty with the back of a fork to form corrugated surface which will do the trick of sealing the pasty. 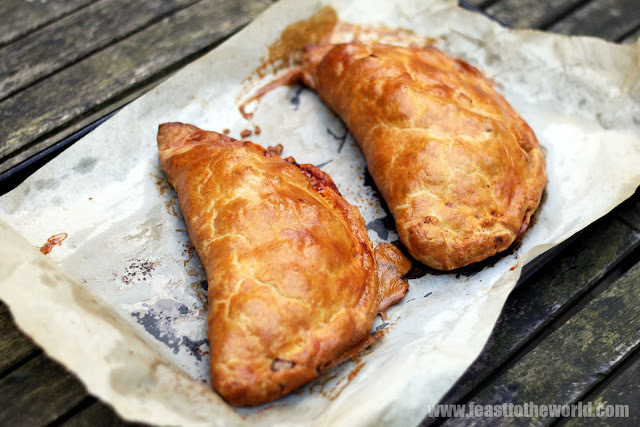 Transfer the pasties onto a baking tray pre-lined with greaseproof paper and bake for 20 minutes. Lower the oven to 180ºC and bake for another 30-40 minutes, until golden brown. Serve hot or cold. Wow, that looks like a beast! 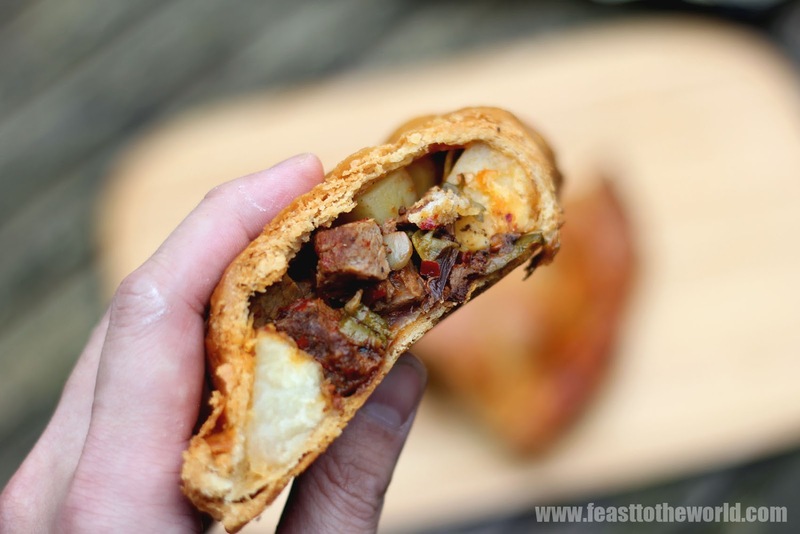 Never thought of putting harissa in a pasty, but you have me salivating now so I might just have to try it! Thanks! Good luck with your book.